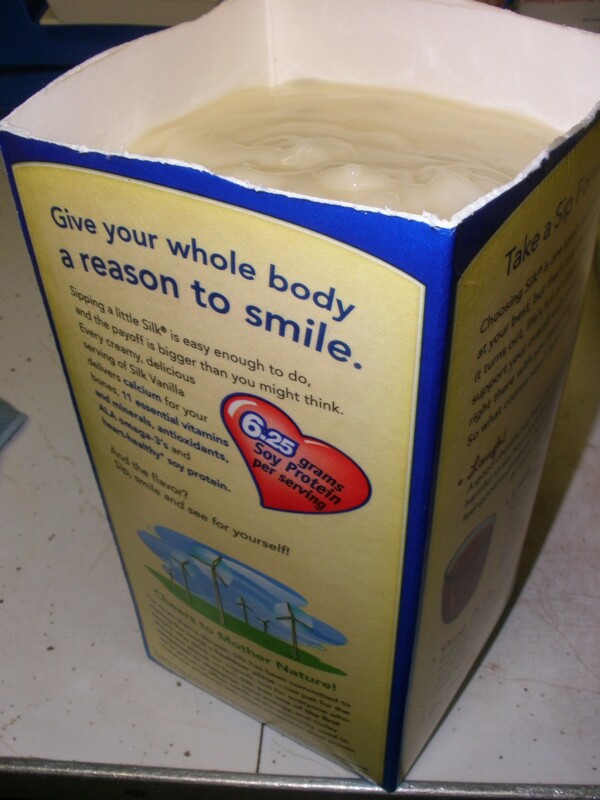 Upcycle an old soymilk carton into a soap mold for your homemade soap. Okay, maybe this isn’t the conclusion to my soap story. However, for now it is. 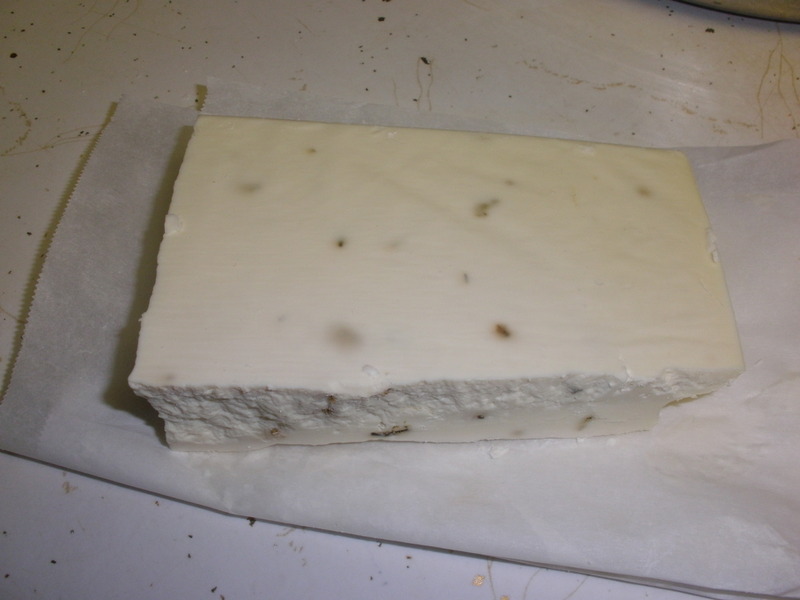 I cured my bacon grease soap in the upcycled Silk carton soap mold over night just like I was supposed to. I peeled away the carton and started slicing the soap into bars to find my soap fragile. Crumbly. 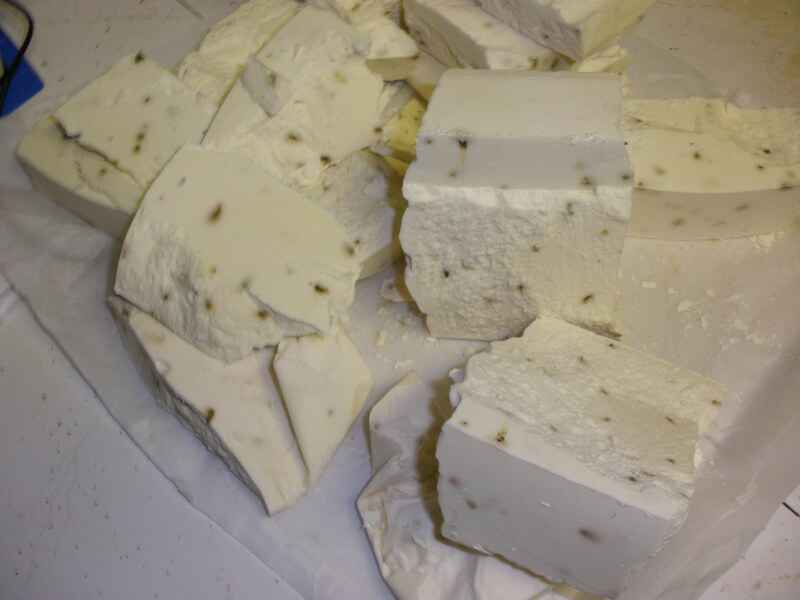 In fact, it looked much like blocks of feta cheese: smooth-ish on the top and crumbly-jagged on the sides where it split when I tried to cut it into bars. Crumbly batch of homemade soap. I should have known to leave well enough alone. I started troubleshooting soap flaws online. I found that crumbly soap could be the result of a few things. One could be too much lye. Since I don’t have a very good scale, that was a possibility. Or, crumbly soap could be caused by mixing the ingredients at the wrong temperatures, stirring too much, or not stirring enough. I wasn’t sure which of these were the culprit, but from my research I determined that I could rebatch or remill my soap. So, I ground the soap up and threw it back in the pan. I added a little more oil (olive, ‘cuz that’s what I had) and some hot water and stirred it. The soap looked like it was coming back together, so I dumped it into a large, glass loaf pan. I’d have used a milk carton, but I’d already used the only one I had. It was at this point I saw my soap separating. It hardened up fine, but there are holes where the unincorporated oil drained out. Maybe I didn’t need that olive oil after all, huh? I should have just left the crumbly bars alone; they looked way nicer like this than they did after I remilled them. So, what have I learned from this experiment? Don’t bother putting dried lavender blossoms in your soap; the color all cooks out and they just look like brown flecks. I need a good kitchen scale. Accuracy is important in soap making. I might’ve been able to avoid my remilling fiasco if I had measured more accurately the first time. Remilling is not for me. The remilled soap is so ugly that I won’t even take a picture (and I’ve posted some ugly pics in the past.) Once the ugly soap has cured and I’m sure it’s not too alkaline, I plan to grind it up into my laundry soap. If I get a crumbly batch in the future, I’ll just grind it up from the start instead of wasting six hours trying to remill a lost cause. This is not the true conclusion of my soap making, because I’ll definitely try again. Now that I have all the kinks worked out, it should be much easier next time. I will only use a quart of bacon grease at a time. “Washing” the bacon fat takes WAY too long if you have to wait for it to cool between heatings. I’ll probably also use a blend of oils to end up with a soap that is more balanced and better for my skin. Check back soon. I bet I’ll have enough fat in a few weeks; my bacon jar already has at least a half a cup of grease in it! For a more succesful soap experiment, check out How I Made Homemade Soap (and Didn’t Screw it up). Wow! I have tallow to render to make soap but never thought to use bacon grease. Did it smell like bacon? Because I don’t want dogs chasing me all over town. What a great use for it! No, it didn’t smell like bacon. If I wouldn’t have rebatched it, the bar that I saved while brittle, cured nicely. I wish I would have waited. I talked to my soap friend and I think I figured out what I did wrong, so as soon as I refill my jar, I’m gonna try again. For some reason that is blowing my mind. Did the lye somehow dissipate the bacon smell? Or did I miss a rendering step somewhere that washed it out? Well, I added lavender to mine, but it didn’t really smell meaty before that when I was cooking it. I’m sure the lye has soemthing to do with it, but did you read the first two posts? I did “wash” the grease and take a lot of the particulates (and probably the smell) out of it. My hubby actually thinks that bacon scented soap would be a good thing.